An excerpt of the poem "Maine Real" by John Campbell of Dedham is paired with paper made by Ed and Pat Ranzoni and exhibited by Gold Star Laundromat. Campbell and his wife, Linda, worked at the Bucksport mill for decades. When Verso Paper Corp. in Bucksport closed, a way of life died. A history had already started to crumble, and a once thriving enterprise began to fade from the town’s landscape, almost ceasing to exist. Left — in the form of a painful reminder — is the quiet, almost skeletal sprawl of the mill. Bucksport poet laureate Pat Ranzoni watched as it all happened and was grieving as well, longing for a time that seemed to be disappearing — a time of papermaking families. “When they announced the mill was going to close I began to see how much it felt like a death and realized that it wasn’t like a death — it was, in fact, a death,” Ranzoni said. “I hadn’t realized how many poems I had that related to the mill, and at first, I thought, ‘I’ll just pull those together and do a small chapbook of my own poems,’ but then I decided I would ask other people to join me,” Ranzoni said. 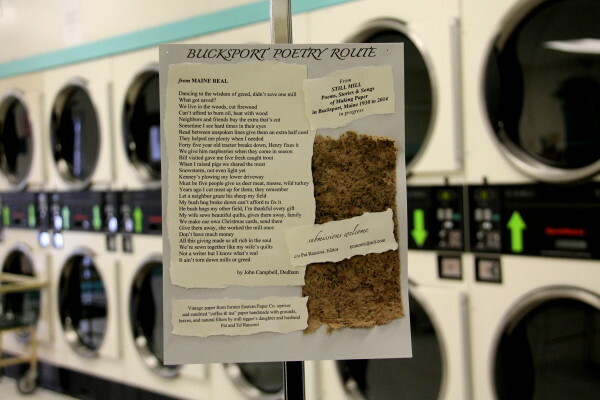 The town-wide display has painted Bucksport with a selection of submissions to the project, which can be found on the “Poetry Route.” The route consists of about 55 pieces posted around the town in places such as the local laundromat and the Town Council chambers, among many others. The broadsides were created to remember Bucksport’s papermaking families and are displayed with hand-made and vintage papers from around the world. Rick Doyle, a staff lawyer at Next Step Domestic Violence Project in Ellsworth, is one of many who have contributed to the undertaking. Doyle is from a papermaking family. His grandfather, mother and brother all worked at the mill, and he has fond memories associated with it. “My grandfather was a machinist in the woodyard when I was a kid, so he only worked the day shift and got out of work at [4 p.m.] every day. Part of our routine as a family was for my grandfather to come home that time in the afternoon,” he said. He remembers his grandfather would always stop at the store after work and call his grandmother to see if she needed anything picked up for dinner. He would come home, wash his hands, put on a fresh shirt and sit down to read the newspaper. This routine daily moment remains a fond childhood memory of Doyle’s. “I have great respect for the millworkers. They’re really proud of the work they did at the mill, and they should be. … It’s important both as a way of grieving and as a way of honoring that heritage and as a way of finding hope for the future. … The next generation or two — they’re gonna hear about the mill, and it’s going to be really important for them to hear those stories and understand that heritage,” Doyle said. The mill has been a way of life and a cultural experience for many of Bucksport’s residents, just like all those in Maine’s mill towns. “Unless you were connected to the mill in some way, it’s been difficult for people to understand the depth of what the mill has meant in our lives — both the good and the hard,” Ranzoni said. But Ranzoni won’t stop there. The postings around Bucksport represent only a selection of the submissions she has received, but the full collection of pieces will be turned into an anthology. She’s looking for the right publisher but hopes the full collection of submissions will appear in independent bookstores throughout Maine in 2016. The display will be taken down on Dec. 5 to coincide with the one-year anniversary of the last paper ever made in Bucksport’s mill.